I’ve always struggled with my skin having frequent breakouts ever since I reached my teens, and subsequently have always been very conscious of it. I have tried every skincare treatment under the sun from vigorous scrubs to homemade remedies. I feel now like my skin is the best it’s been in a while and other than age and ‘growing out of it’ it’s down to my current skincare routine. I went to the doctors a year or so ago and was prescribed a gel called Epiduo for acne. It took a while for my skin to get used to it, it made my skin really dry and sore originally but now it works wonders. The idea is to place the gel on any breakouts every night to help them clear up, and I’ve found although it doesn’t make those pesky spots disappear immediately, it definitely helps them clear up sooner, or if I’m super speedy I can get rid of those dreaded under the skin spots before they surface! Epiduo is the only spot treatment I use, and for the rest of my routine, I strip it right back using Cetaphil’s cleanser and moisturiser/moisturising lotion. 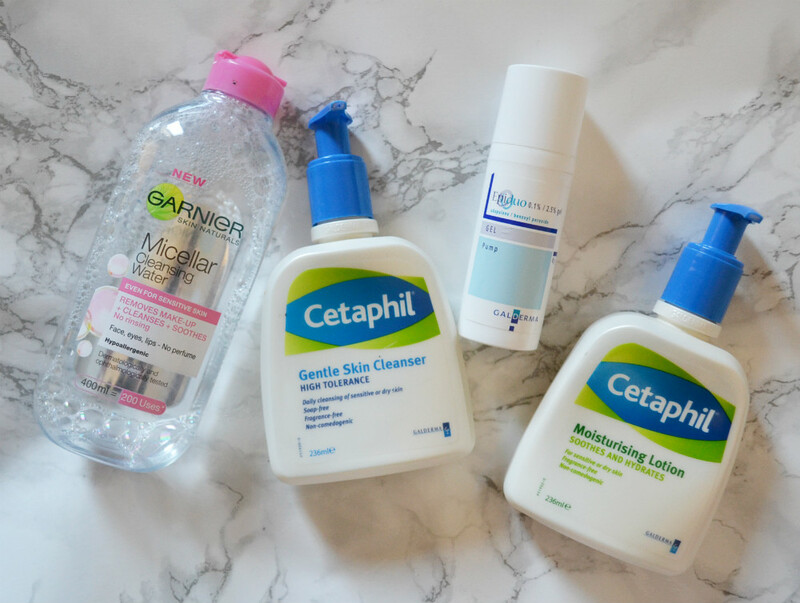 Cetaphil is for sensitive skin being soap and fragrance-free and I find that’s just what I need. I hate the thought of rubbing lots of nasty chemicals all over my face. For makeup removing, I’m a big fan of Garnier’s micellar water and have repurchased it many times. A couple of pads does the job brilliantly, and any extra makeup left over is soon taken off with cetaphils cleanser. I think, especially being a blogger, it’s very easy to get caught up in a big extravagant skincare routine which involves lots of steps with lots of different products, and while I have no doubt it works for some, sometimes I think less is more. I’ve found a very simple non-time-consuming routine and my skin is loving me for it. What’s your go to skincare routine? Do you have any holy grail products?